Download "Email Client configuration and migration Guide Setting up Thunderbird 3.1"
1 Client configuration and migration Guide Setting up Thunderbird Open Mozilla Thunderbird. : 1. On the Edit menu, click Account Settings. 2. On the Account Settings page, under Account Actions, click Add Mail Account. 2. In the Mail Account Setup dialog box, enter the following account information: 1. Your Name enter your name as you would like to appear on outgoing mail 2. Address - enter your address e.g. 3. Password - enter your password and click Continue. 3. Now enter the following 1. Username e.g. vgoth00 If your username and Alias are different then you may need to enter 2. 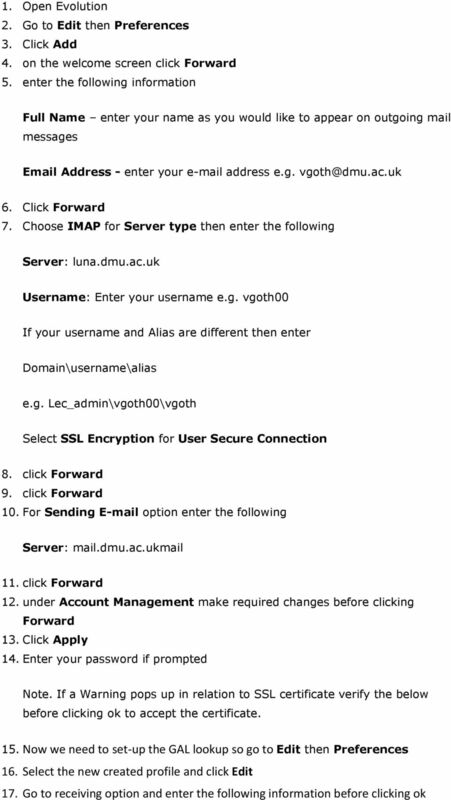 Incoming - luna.dmu.ac.uk, IMAP, 993, SSL/TLS 3. Outgoing - mail.dmu.ac.uk, SMTP, 25, None 4. Click Manual setup to complete the setup 1. Select server setting and change the authentication method to normal password and click ok. Note. If a security exception pops up then view the certificate and verify the below making sure selecting permanently store this exception is selected before clicking on confirm security exception. 2. Now copy from the FOT Mailbox to the ISAS Mailbox. 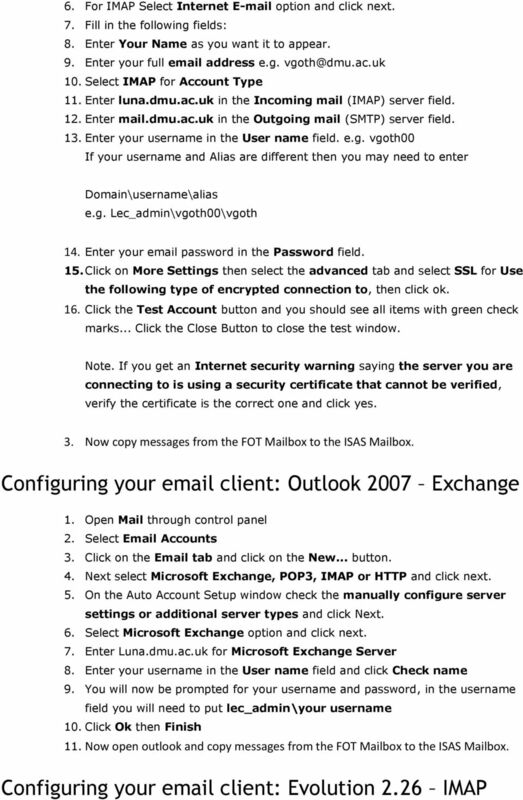 Configuring your client: Outlook IMAP 1. Open Outlook Click the Tools menu, and select Account Settings. 3. Click on the tab and click on the New... button. 4. Next select Microsoft Exchange, POP3, IMAP or HTTP and click Next. 5. On the Auto Account Setup window check the manually configure server settings or additional server types and click Next. 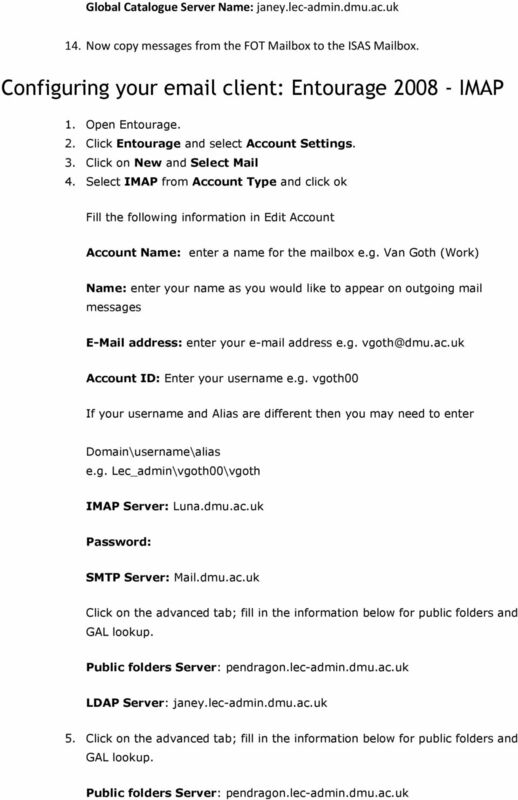 6 LDAP Server: janey.lec-admin.dmu.ac.uk 6. Click Ok 7. 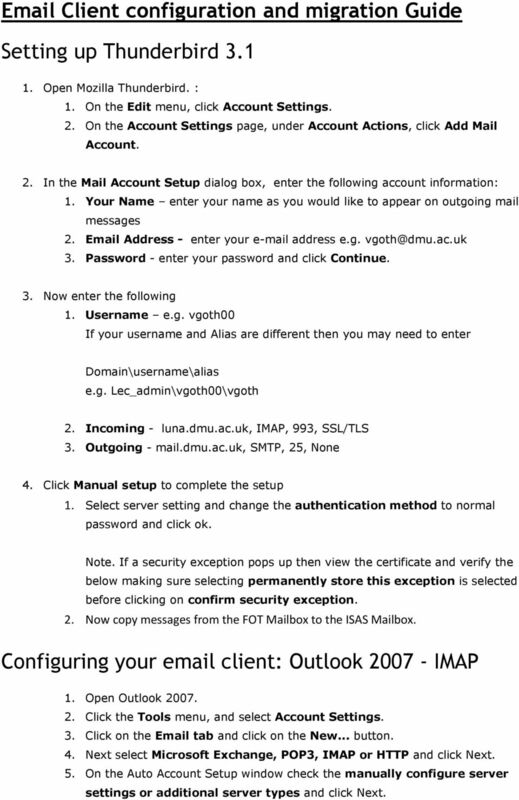 Login then copy from the FOT Mailbox to the ISAS Mailbox. 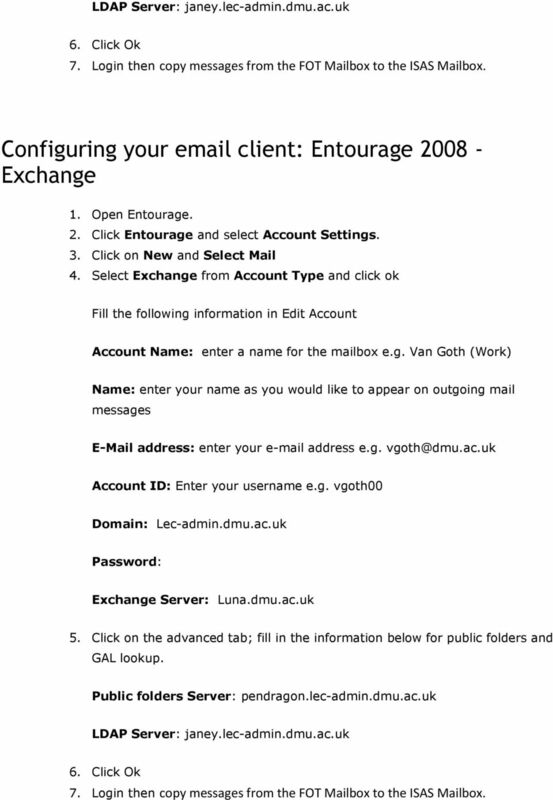 Configuring your client: Entourage Exchange 1. Open Entourage. 2. Click Entourage and select Account Settings. 3. Click on New and Select Mail 4. Select Exchange from Account Type and click ok Fill the following information in Edit Account Account Name: enter a name for the mailbox e.g. Van Goth (Work) Name: enter your name as you would like to appear on outgoing mail address: enter your address e.g. Account ID: Enter your username e.g. vgoth00 Domain: Lec-admin.dmu.ac.uk Password: Exchange Server: Luna.dmu.ac.uk 5. Click on the advanced tab; fill in the information below for public folders and GAL lookup. 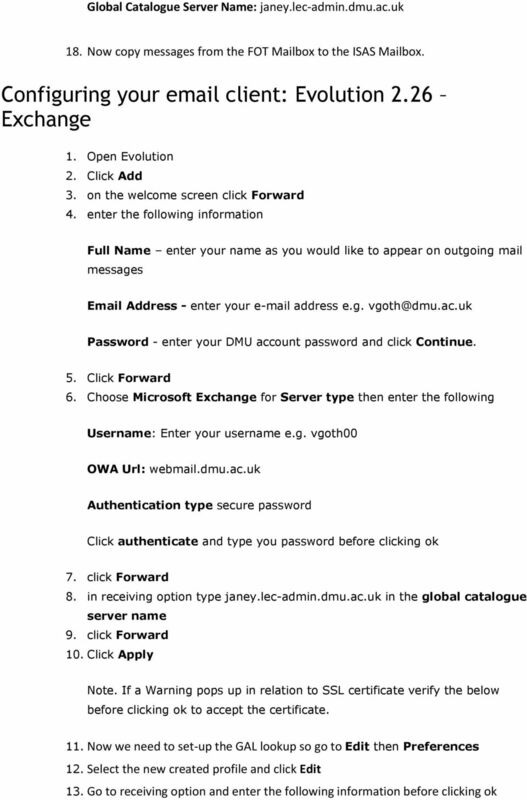 Public folders Server: pendragon.lec-admin.dmu.ac.uk LDAP Server: janey.lec-admin.dmu.ac.uk 6. Click Ok 7. Login then copy from the FOT Mailbox to the ISAS Mailbox. Steps for: POP (Post Office Protocol) and IMAP (Internet Message Access Protocol) setup on MAC Platforms The following instructions offer options for POP and IMAP e-mail retrieval locally on your MAC. For details for obtaining this later version; see the Known issues & Limitations, section at the end of this document.